Hi, my name is Steve Roberts, my first run was with the Sudbury Joggers Beginners group at the end of October 2017. I officially joined Sudbury Joggers in December 2017, but that is not where my running story started. To put things in to perspective, I should go back before I joined Sudbury Joggers! I suffer from severe allergies. Grass and dust are the worst for me, but other pollens also set me off – I tend to suffer from allergy problems from February through to October depending on weather. To make things worse I suffer too from sinusitis – that’s sinus inflammation. The sinus issues combined with my allergies gave me so many other problems like nose bleeds and sneezing fits. Sometimes these sneezing fits had lasted up to an hour and caused severe headaches and dizziness, along with back and neck pain, sometimes it became too much, I simply ended up passing out! Because of this, I elected to spend the most of the past two decades hidden in doors as my dust allergy is a lot easier to manage. At the end of my teens, I’d finished with the Army Cadet Force, had moved to working 20+ miles from home, so I’d stopped walking and cycling to work and college to getting a bus or driving. During my late teens and early twenties, like a lot of us, I was going out drinking with friends. I was also part of my local pub’s crib team. But this meant I could also be drinking up to 50 pints of lager in a week! The result of no exercise and bad eating and drinking habits (please note they were habits not problems!) I put on a lot of weight. At one point I was over 24 stone, in my active late teens I was 17.5 stone. You might think that headaches, neck and back pain, allergies, sinuses and obesity might be the end of my problems, but no… I also suffer from severe eczema, especially on my feet. With all the health problems I have, you can see why I have spent so much time staying indoors! Now you know the reasons why I had never been active, especially as a runner – it was not just because I hated running, even as a kid… now we come to why I started running and why I joined Sudbury Joggers. In September of 2017, I’d asked my son what he wanted to do for the October half term. I had booked the week off work to be with him. His answer “I’m happy to stay indoors, cuddle up and watch TV”. There of course is nothing wrong with that; I love to do that with him. However, it is not what you want your 10-year-old to want to do for an entire week of holiday. I had never wanted to be a parent that said to their kids “do as I say, not as I do”. I could not very well insist he should be outside or wanting to visit someone or somewhere, when I knew his answer came from a place of love – he knew doing that is something I would be happy to do and would not cause me any more pain and discomfort than I was already in. It was at this time that my place of work, iSiteTV, were putting calls out to staff who wanted to run the Colchester Half Marathon. Before I could run, I walked! As someone who had never been a runner, I was not sure I could do this. But I knew I could push myself if I needed to. Throughout June 2017 I walked 10,000 steps a day for Cancer Research UK. I completed this after my Nana died of stomach cancer in April. I’ve always been a strong supporter of Cancer Research UK – I’ve had friends and family that have both beat cancer and died of it. This time I’d seen a TV advert where Cancer Research UK were doing a campaign that involved walking. Running I always thought I would not be able to do, so I’d just help support those that did run. After decades of being inactive, I knew 10,000 steps a day was a huge increase from the 50 to 1,000 steps I had been doing each day. Yes, that is right, some days I was doing only 50 steps for the entire day – for someone who was usually up for 20 hours of the day, that is especially low! Well, during the month of June 2017, I walked a total of 300,556 steps. This equates to roughly 150 miles of walking. That’s like me walking from London to Manchester! Completing the Walk All Over Cancer campaign allowed me to raise over £1,000 for Cancer Research UK. Being outside wasn’t truly good for me! Steve Roberts’ bad foot – 3 month’s after Walking All Over Cancer! Walking so far outside caused my allergies to go mental. And my feet, well let’s just say that my eczema went nuts would be an understatement. On top of that, walking along the old railway line near the end of the campaign, I’d landed badly on a large stone and hurt the ligament along the base of my left foot! After June, what did I go back to doing? That’s right, you guessed it, I was once again inactive and sitting in front of a computer screen, a TV screen or a windscreen! It wasn’t until September that I’d just started to arrange going back to my personal trainer that helped prepare me for the 10,000 steps a day, as I had intended to up what I did in June 2017 to completing a 5km run for Cancer Research in the summer of 2018. That idea came from sister-in-law, who herself ran a 5km race to raise money for Cancer Research UK near the end of June 2017 whilst I was walking for the charity. After hearing what my son Charlie had said about the October half term, I knew I had to do more to set a better example. I wanted to practice what I wanted to preach! So, I decided I would no longer run a single 5km race for Cancer Research UK. Instead I signed up to run the Colchester Half Marathon. Now remember, this was a time where I had never run. It was 3 months after suffering a lot of pain from walking 150 miles in June, and I was still suffering the after effects too. But it was not going to stop me from quadrupling the distance I was going to run and cutting my preparation time from doing a summer run to running 13.1 miles (21km) at the end of March 2018. Doing this would allow me to not only raise more funds for Cancer Research UK but to set a good example to my son. After paying to enter the Colchester Half Marathon a friend at work asked me if I had heard of parkrun – after not really leaving the house except to go to and from the office for work, the answer was of course “no!”. It started with a parkrun! I then found that there was a parkrun just down the road from me at Great Cornard Sports Centre, but I was worried that I would not be able to run the 5 kilometres. So, I reached out via the Great Cornard parkrun’s Facebook page and asked if it would be a problem if I walked the parkrun. A short time later I received a reply telling me that it would not be a problem to walk the entire course. So, on Saturday, September 27th, 2017 I attended my first parkrun. I wanted to make sure I could walk before I could run, and I did! I completed my first parkrun in 51 minutes and 1 second. The entire way around I was supported and encouraged by all the marshals, other parkrunners that were lapping me and of course by the lovely Alison who was that week’s tail walker. I headed straight home afterwards – I had only walked 5km but I couldn’t move afterwards. I’d used so many muscles I’d ever used for a very long time! Despite the pain and discomfort from just walking the Great Cornard parkrun, I knew that once I started running the 5 kilometres I could then work being able to run longer distances and that working with my personal trainer once a week would not accomplish that on its own. So, I still returned the following week to the next Great Cornard parkrun. This time the tail walker was James “Mexican Jim”. Whilst we were walking I’d told him why I was out doing the parkrun and he told me about Sudbury Joggers and how they would be able to help me. Well, as of the second parkrun, I was not ready to start running just yet! I attended 4 parkruns before I first attempted to do any running. My 5th parkrun I did some running for the first time. The result – I knocked off 4.5 minutes from my previous personal best of walking the Great Cornard parkrun! To get to the point where I was ready to run at parkrun took not only some training from my personal trainer at the beginning of the week, but I’d also attended my first session at Sudbury Joggers where I ran with the Beginners group doing 10 minutes out and 10 minutes back. I was amazed to see that so many people who ran at Great Cornard parkrun were also members of Sudbury Joggers. It’s always nice to know people! But the most amazing thing was that just like at Great Cornard parkrun, the runners at Sudbury Joggers were so supportive. No matter how slow I ran, someone always stayed behind to run with me. Without the community here at Sudbury Joggers, I would not have got as far as I have. I’ve gone from walking a parkrun a few months ago to last week running my first race – the Tarpley 10 mile. This was, for me, a practice race for the Colchester Half Marathon. The support and encouragement from everyone at Sudbury Joggers has helped me fight though all the pain and discomfort. They’ve helped me not only run the Tarpley 10, but run the entire 10 miles and run it in 2 hours and 16 minutes. A few months ago, I was doubtful I would be ready for the Colchester Half Marathon in time, but after Sunday’s race, I know that I am. 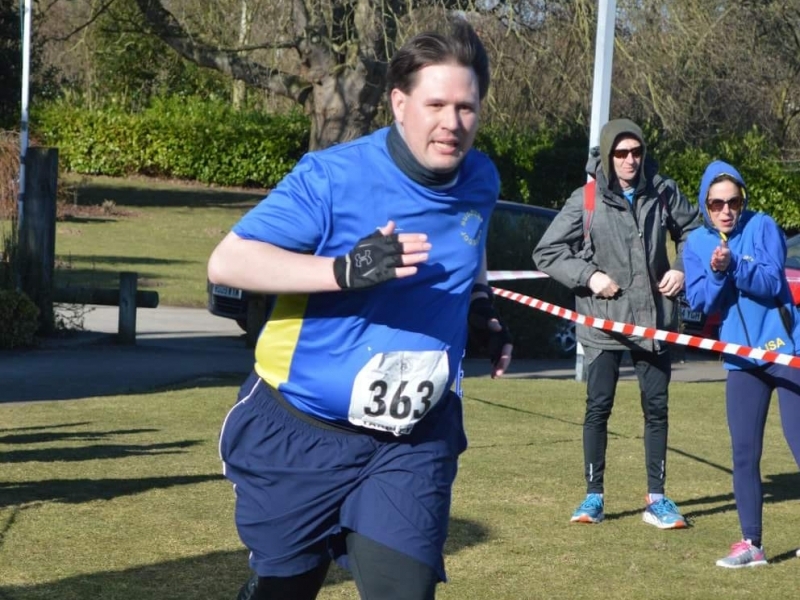 Once the races are open for entry I also plan to run at the Ekiden Relay, Martlesham 10km and the Stowmarket Scenic 7 – and that just takes me up to the beginning of September! And just in case you thought that was a lot, I have also now signed up to run the 2018 Baxters Loch Ness Marathon on the 23rd of September where I’ll be once again running to raise money for Cancer Research UK. If you doubt you can ever be a runner or that running is not for you, please don’t. My story alone should show you that if I, someone who is obese and has multiple other health problems can run, so can you. Is it hard to do all this? Absolutely. Is doing all this running causing me a lot of pain and discomfort? Yes. But this time the pain is worth it – I’m showing my son the benefits of keeping fit and it is helping me in many other ways too… in the past 10 months I’ve lost over 2.5 stone. All it takes is the determination to continue and that gets backed up by the fantastic support you get from what becomes your extended family here at Sudbury Joggers. If you’re still unsure about joining us, come down to the Kingfisher Leisure Centre for 6.30pm on a Wednesday to join the Beginners group – trust me, you’ll come again.